In metaphysical beliefs, the garnet gemstone is a stone of both health and is believed to extract negative energy from the chakras of the wearer and transmute that energy into a more beneficial state. It's also known as a stone of commitment to both one's purpose and to others as well as to oneself and believed to foster expressions of love through warmth and understanding. In many ancient cultures, the garnet is believed to contain within it a flash of lightning that sparks creativity and fosters confidence. Rhodonite is known as the 'stone of love' and is believed to assist in achieving one's greatest potential by dispelling anxieties and promoting coherence during chaotic encounters. Both in color as well as purpose, these two stones work beautifully together in this lush-looking handmade gemstone charm bracelet. 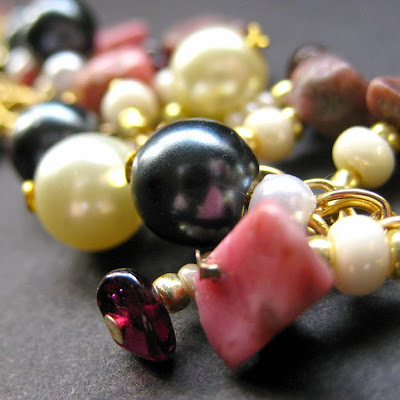 The stones are then combined with glass pearls in creme and deep midnight blue clustered together on a gold plated chain. This bracelet is a beauty to behold, luxurious and unique. The perfect accent whether you want to dress up a casual outfit or create a focal accent on an elegant ensemble. This item is a unique OOAK (One of a Kind) piece. Bracelet measures at 8.5" (22 cm) in length including clasp.